Congrats. to Red Wedding for winning the LUDA Winter League 2016 playoffs! 5 vs. 5 Coed -- At least one girl per side on the field. 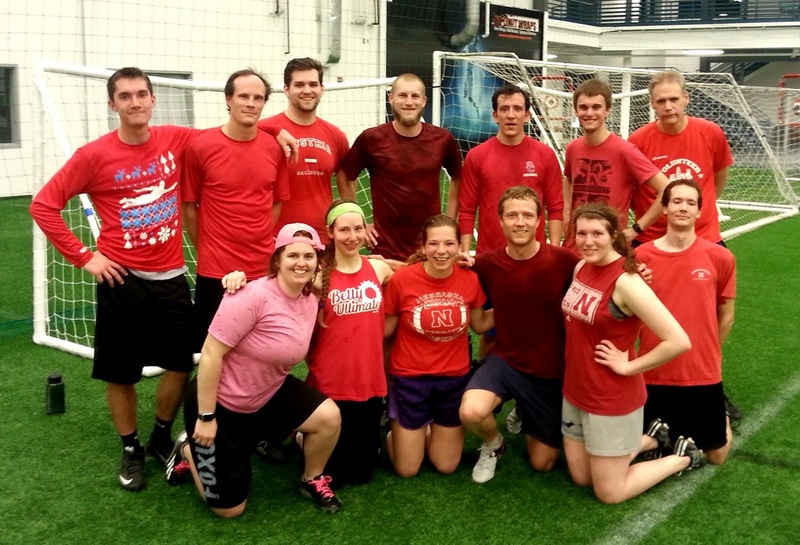 Captains shall make further gender balance decisions on a game-by-game basis. For each half that a team cannot field at least one girl, that team shall be assessed a penalty of two points per half (for a maximum of four points per team per game). Two games per team per night: at 9:00pm and at 10:00pm. Registration fee is $30/player to cover field rental. League dues must be paid by week 3, February 4. Contact us at info@lincolnultimate.com if accommodations are needed. Starting on week 3, if a team plays a game and fields a player that has not paid their league dues, that team will forfeit that game 0-25 on the official schedule. Each round is 60 minutes. Games last 55 minutes, with a 5-minute warning announced at 50 minutes. Time cap strictly enforced, but ties are not permitted: the last point will always be allowed to complete. Each game is to 55 minutes or to 25 points (no win-by-two rule). Halftime at 13 points. Substitutions are made on the fly from mid-field, with a high-five before the sub can come on the field. 2 timeouts per team per game. Substitutions may be made by each team freely during the timeout.